At Morey, we build on every child’s unique gifts so each person becomes a self-directed, socially conscious, educated member of our diverse community, both inside and outside of the classroom. 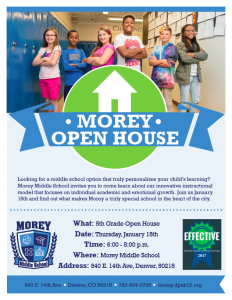 Please join us for Morey Middle School’s Open House this Thursday, January 18th, from 6:00 – 8:00 p.m.
We are excited to share with you the innovative practices at Morey these days! Highly Gifted & Talented Magnet Programming: Morey is the only middle school in Denver that offers programming specifically for students identified as Highly Gifted & Talented. That means our students are grouped with their intellectual peers, which supports their academic and social/emotional needs. Teachers are HGT trained to extend curriculum and add depth and complexity into their lessons, while supporting students’ affective needs. Personalized Learning: Morey is on a trajectory to providing personalized learning experiences. This means that students are learning how to drive their own learning with a pace that is responsive to student needs, under the guidance of trained mentor teachers. Social & Emotional Focus: Morey has school-wide mindfulness, habits of success lessons, personal relationships with each student, and engagement of the whole child to help your student succeed in more than “just” academics. Enrichment Opportunities: Weekly exploratory classes, service learning, week-long enrichment trips, after school clubs, and more! We will have some fun activities for the students during the Open House, so feel free to bring your 5th grader with you! Please RSVP for Morey Middle School’s Open House on Sign Up Genius so we can make sure we have enough refreshments for everyone. If you are unable to attend, no problem! We have school tours every Monday from 8:00 – 9:30 a.m. until the choice window ends (February 28). Please email Bertie Fiz at Bertie_fiz@dpsk12.org to set up a tour date or schedule a shadowing experience for your child. We hope to see you Thursday evening. At Morey Middle School we build on every child's unique gifts so each person becomes a self-directed, socially conscious, educated member of our diverse community, both inside and outside of the classroom.